Kari Lavalli came rather late to dogs, getting her first dog, a doberman pinscher, at age 16. She trained that dog with the old fashioned Kohler methods which provided only mixed results. Nevertheless, that dog accompanied her to college and graduate school, but unfortunately died from cancer at the young age of 6. When she moved to Woods Hole to conduct her research full time, she got her second dog, a Siberian husky. Joining a training group on Cape Cod, she trained that dog for advanced obedience work and tracking, but never competed as the dog developed an autoimmune disease that rendered her blind. 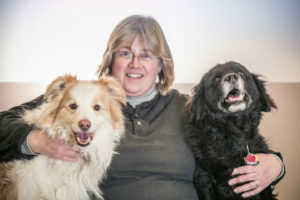 Kari then picked up two rescue dogs — another Siberian husky while she was completing a postdoctoral position in Nahant and a border collie when she moved to Texas to work at her first faculty position. Kari used the well-trained, older dog to train them by mimicking basic manners. Kari and her husband moved back to Massachusetts in 2004. In 2006, she was contacted by a former colleague who also bred Portuguese Water dogs and was offered an older female PWD puppy with the caveat that the dog would be co-owned and bred and that it needed to be trained and titled. Thus, Kari and her dog, Asta, entered the world of competition dog training. In graduate school, Kari had read Karen Pryor’s book, “Lads Before the Wind”, which had outlined the method that Karen Pryor would eventually bring to the world of dog training: clicker training. She embraced this “new” method of training and titled Asta to a CD in obedience and an RE in rally obedience by age 2. Asta later obtained a CD-C obedience title through the CDSP program and has a RATO title in Barn Hunt and a tunnelers title in NADAC agility. She also, at age 9, finally obtained her NW1 title on her fourth attempt. Asta is mostly retired now after an cruciate tear at age10, but she enjoys training in tricks and is participating in Performance Plus’ fitness and conditioning class to keep her as strong as possible in her twilight years. When Asta was bred in 2009, as part of an NIH study on a gene marker for a particular coat-type in PWDs, Kari kept one of the male puppies, Darwin. Like his mother, Darwin was trained and titled by age 2 to an AKC CD and a CDSP CD-C in obedience, as well as a RE in rally obedience, venues in which he consistently scored well and placed in the top three. Along with his mother, he became one of the first dogs in the Northeast to be trained in the NACSW nosework venue and became the 6th PWD in the country to get a NW1 title, which he accomplished also at age 2. At age 3, he earned his Junior Water certificate in PWD water trials and at age 5 he earned his Apprentice Water Dog title, his RATN (barn hunt) title, and his NW2 title placing 2nd overall in time. He then went on to earn his RATO in barn hunt placing first in 2 trials and earned his AKC Novice and Open Agility titles and Novice and Open Jumpers with Weaves titles, as well as novice agility titles in NADAC. In 2016, he earned his Working Water Dog title. He continues to train in obedience, nosework, agility, and tracking. As a result of his numerous titles in multiple venues, the national Portuguese Water Dog Club of America awarded Darwin both a Bronze and Silver Register of Merit in 2017 — the first “improper” coated PWD to earn those awards. He also holds a Merit Achievement Level 3 Certificate from the PWDCA. Kari came to Performance Plus in 2013 when she and her husband took in a 3.5 year old border collie that was being rehomed by the collie’s breeder. This dog, Uta, was leash reactive and child reactive and through the Chill Ubu program offered by Performance Plus, became more calm working around other dogs and now plays frisbee and tug with a variety of children. It was this experience that hooked Kari on the training methods offered by Performance Plus. Uta went on to earn her Canine Good Citizen title and a NW1 title, taking 3rd place overall in time for that trial. She also earned a Beginner Novice obedience title, and recently earned her NW2 title, taking 1st place overall in time. She continues to train for competition obedience, rally, and tracking, and is dabbling in herding and dock diving. She is also learning some agility. In 2014, Asta had her last litter and produced a female singleton. Kari kept that puppy, Beleza, who is training in obedience, agility, and water. Bell earned her Junior Water Certificate at 1 year of age and came very close to also earning the Apprentice Water title the same summer. Kari was able to start clicker training this dog at 5 weeks of age and saw the power of using that method to shape the dog’s behavior and to create a dog that loves to learn new things. Kari has trained under a number of area obedience instructors and has attended numerous agility and tracking seminars as well as water training seminars by Canine Water Sports and area PWD clubs, and several obedience and canine conditioning seminars. She has and continues to work through several online programs such as Susan Garrett’s Recallers and Handling 360 course, OneMind Dog’s agility instruction, Amanda Shyne’s Data Driven Agility course, and a variety of Fenzi Dog Sports Academy courses. She has taught beginner’s water clinics in the summer on Cape Cod for the Mayflower Portuguese Water Dog Club and has served on that club’s board of directors from 2010 to 2015. 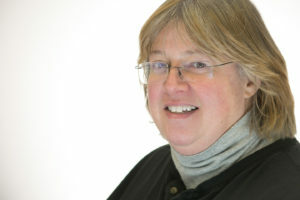 She is currently an officer on the board of directors of the Tracking Club of Massachusetts. She teaches novice and advanced tricks classes at Performance Plus and all of her dogs are titled in that venue at various levels. Kari holds a Ph.D. in biology from the Boston University Marine Program and specializes in the behavioral ecology of lobsters, focusing mainly on how they avoid predator attacks and how juvenile lobsters alter their feeding behavior to avoid exposure when they are very small and vulnerable. She has taught animal behavior at the college level and brings a variety of approaches to training dogs and their owners. She teaches Basic Manners classes and hopes to develop the same joy in training in her students that she has achieved with her own dogs. She believes strongly in using training strategies that build the relationship between the dog and owner, such that owners can more thoroughly enjoy and understand their dog’s behavior and personality, and can provide for the mental and physical well-being of their canine companions. As with her human students, she believes that learning should be a life-long endeavor, and hopes that dog owners will embrace the idea that they can enrich their dog’s life by teaching it how to love to learn and then continue to provide learning opportunities for their dog throughout its lifetime, not just to the point where the dog becomes a well-behaved pet.